Create a beautiful place to enjoy your backyard by adding a raised deck to your home design. If you live in a place with beautiful weather during the summer or a mild climate all year round, you want a place to enjoy the outdoors. Raised decks add an interesting design element to the back of your home, while keeping your backyard open and add space for a patio. These raised deck ideas can help you to design your deck from beginning to end. Just like a house, the foundation of your deck will define all of your subsequent deck design choices. While it may seem like a deck frame is a basic design, there are several options that will affect the look and feel of your finished deck. You want to choose designs that will fit well with your overall home design. This includes your deck shape and your deck’s supports. A square deck frame is the most traditional design for a raised deck. It extends straight out from the back of your home and creates a large rectangular platform. This frame has the most flexibility in terms of style. Because it’s a common shape, it can take on whatever aesthetic you choose for your materials and furnishings. It also creates a standard shaped under deck patio area. A rectangular raised deck design typically gives you more space to work with than the circular deck design mentioned below. If you want a more unique deck design, consider creating a circular or octagonal shaped deck. These decks have a more compact design because of the rounded or angled edges. These shapes are great for homes that have smaller backyard spaces. They typically are matched with modern or contemporary home designs. However, a circular deck can take on a traditional gazebo design with the addition of a roof. Some decks have a rectangular base but have a circular section of the deck jut out in a corner for a communal area. The shape allows the homeowner to create a space with lots of seating that faces each other and a centerpiece, such as a fire pit. Choosing the right deck supports is important for two reasons. The first is the obvious safety considerations. You want your deck to be structurally sound and safe for you and your guests to walk on. The second is to continue a cohesive design through every aspect of your deck. Your deck should have its own supports, rather than relying on the strength of your home. Decks rely on both vertical and lateral supports. The lateral supports are the actual outline of the deck that are commonly seen in the construction phase. This is secured to the house, but it’s also supported by the vertical supports. The vertical supports are columns that go from the ground up to your raised deck. Many contractors or DIY homeowners anchor these columns to the ground with a cement footing. The cement base is under ground and provides the most stability. When you connect your frame to your posts, use galvanized hardware to ensure that it is durable. When considering material options, think about the design that you want to achieve for your deck. These supports will also create a frame for your under deck patio. The most common material used is wood. It matches the rest of the deck and can be stained and treated to last outdoors. If you want wood supports, but want a more polished look, you can use stone column covers that slide over the posts. You will have to install these before you finish your deck frame. Brick and stone deck supports are typically found with traditional style homes that have the same material in their facades. If you want a mixture of the two, you can anchor your wood post to the ground with a large stone base. This is both secure and finishes your column with a traditional touch. After your frame is in place, the next design choice will be your decking materials. There are a few different options depending on what you’re looking for from a design standpoint. They range from rustic all wood deck designs to modern designs that are chic and simplistic. These decking materials have different costs and maintenance levels. All wood deck designs have the most flexibility of design. If you’re not sure what you want to use your space for or what design aesthetic you want right away, wood gives you the flexibility to change it up. It is the most common and cheapest decking material option. Depending upon the wood species you choose, there are different finishing options. Stains and sealants can help to lengthen your wooden deck’s life. 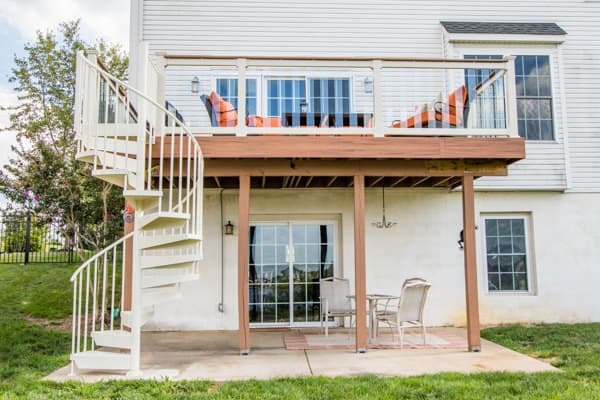 No matter what kind of preventative maintenance you put into your deck, you will need to go through a deck restoration process every few years. This not only enhances the look of your deck, but also ensures that your deck is still structurally sound. Any rotting wood should be removed and replaced as soon as the problem is noticed. There are some rot resistant wood species, such as teak and California redwood, which can put off the restoration for a little longer. However, you will still need to repair and restore the deck every so often. Composite decking material has grown in popularity in recent years. Composite decking material is made up of a mixture of wood particles and plastic. This combination creates a weather resistant and long lasting deck. It is typically more expensive than lumber, but your maintenance costs will be much smaller. You won’t have to restore your deck in the same way that you would an all wood design. However, you can’t repair a composite deck board. Once the material is scratched or broken, you must replace it. While the low maintenance costs are appealing, you won’t have as much customization opportunity with composite decking materials. Because of the plastic in the material, stains and paints will not permeate the boards. This means that you will have to use whatever colors are offered. Some people choose to create a decorative floor on their deck with two tone composite board patterns. Searching for tips to give your raised deck design a lift? Let our expert stair designers show you the value of a spiral stair. Request a consultation, or contact us directly at 1-800-368-8280. A major benefit to having a raised deck is opening up the space below. You can keep the space as part of your backyard. Another option is to finish your under deck patio area for an additional outdoor entertaining space. No matter what you plan on doing with the space, connecting your raised deck and the rest of your backyard creates a cohesive and efficient backyard design. When you think of deck stairs, you probably see an all wood straight staircase coming off of a raised deck. This classic design is a great complement to traditional and craftsman style homes that feature exposed wooden elements and clean lines. Traditional deck stairs are typically made from all wood or composite decking materials. The benefits and drawbacks for these materials being used in a staircase is the same as a full deck design. You want materials that will hold up to heavy foot traffic. As with a full deck, you’ll want to restore all wood stairs every few years and replace composite steps as needed. A full straight stair will take up a large footprint. This could be problematic if you want to have more of your backyard open. One of the biggest benefits to having a spiral stair attached to your deck is the small footprint. Because of its spiral design, the footprint is kept to a small circle in your backyard. This allows you to connect your raised deck to your backyard or patio underneath without losing too much green space. Not only is it a functional piece, but it creates a beautiful centerpiece for any backyard. Spiral stair designs can be customized to match any home design you choose. The Aluminum Powder Coated spiral stair has a maintenance free coating on the already rust prohibitive aluminum frame to ensure that your first cost is the only cost. If you want a subtly accent piece to your home, you can choose to keep your stair a classic black or white color. However, if you want a standout piece, the aluminum stairs can be powder coated a custom color upon request. If you want a more industrial or modern feel to your deck stair, the Galvanized Exterior spiral stair is the perfect solution. Our steel stairs go through a hot dipped galvanizing process that coats the stair in a protective barrier that prevents it from rusting. As a result, the stair has an industrial metallic finish that weathers over time to take on a battleship grey color. If you want a custom color for your Galvanized Exterior stair, you can paint your stair after about six months with the proper pain and primers. Both of these spiral stair designs can have additional safety features, such as the diamond plate treads. These come standard on the metal stairs and provide a non-skid surface that is perfect for outdoor stairs that are exposed to the elements. Raised decks are the perfect place to enjoy the outdoors and relax during the spring and summer. However, on days when the sun seems to be particularly hot, you may want a place to relax outside with some shade. Just because your deck is on a second floor doesn’t mean that you have to go without some extra sun protection! These raised deck ideas for some shade can help you find that little piece of shaded solace on your deck. Pergolas are a type of awning that are usually found in gardens and are made from all wood designs. They can be large enough that they extend out from the house and shade your entire deck, or small enough to cover one corner. The basic design of a pergola has an open roof that can support climbing plants and vines. This is one way to incorporate green space into your deck while still having the shaded protection you’re looking for. If you want more coverage, you can add a lattice wall to the outside of your pergola. Incorporate your climbing plants into the lattice panels to create a privacy screen for your deck. If you don’t have as much of a green thumb, you can attach curtains to the lateral beams that make up the open roof of your pergola. This can give you protection from direct sunlight and is an easy DIY project for any homeowner. Retractable awnings are a popular way to add shade to your deck without the permanency of adding a roof. 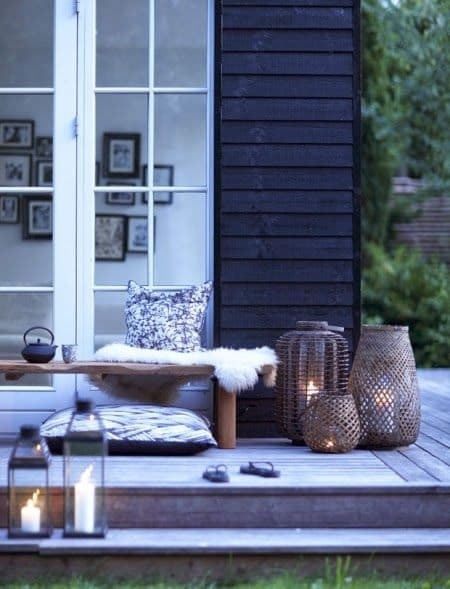 There are two ways to incorporate this raised deck idea into your home design. If you want to have someone install the awning for you, you can get a remote controlled retractable awning that extends out from your home. These are obviously going to be a little pricier than other options, but they usually come with warranties. The awning is completely hidden when not in use with the curtain and framework being contained to a small box that also holds the motor to extend it. The design options will vary depending upon the brand you choose. If you want a budget friendly version of a retractable awning, you can construct an open frame, much like a pergola, and attach it to your deck. Create small tracks in the lateral beams and install hardware that supports a curtain that can be slid out and back as you need it. Another DIY version of the retractable awning is to attach cables from your home’s exterior wall to a beam on the opposite side of your deck that can hold hooks which support your curtain. The most important part of a DIY curtain awning is to ensure that the fabric will stand up to the elements. There are several different types of outdoor fabrics that come in a variety of colors and designs. If you can’t find the right curtain for you, you can always paint your own and seal it with a protectant coat! Not only is lighting a definitive part of any home décor, but it also creates a safer environment for you and your guests. By adding sufficient lights to your outdoor space, you are able to clearly see any obstructions in your walking path or steps from one level to the next. You aren’t limited to bulky porch lights when choosing lighting for your raised deck. These lighting options can complement any other raised deck idea you decide to use. Rope lights are a popular option for any outdoor lighting application because of its durability. They are made up of string lights that are encased in a weather proof and UV protectant tube that is flexible and can fit into a number of spaces. A popular application for rope lights is to wrap them around deck railings or around the handrail of your deck stairs. They come in a variety of colors and lengths so that you can find the set that works best for your raised deck design. Tiki torches are a classic lighting option for any deck. They’re often cheap and can be found at almost any store that sells outdoor décor. They typically have a bamboo frame and have a wick that is attached to an internal container of lighter fluid. One major benefit to these torches is that there are plenty of design options that include citronella products. These can be lit to keep any unwanted bugs away from your deck and your guests comfortable. Deck lanterns can come in just about any shape or size you can think of. The same can be said for their design materials. These light fixtures can be designed to match any home design, from traditional to eclectic. They also come with a variety of light source options. The two most common are candles and light bulbs. Candles will give you a softer light, while light bulbs will fill your entire space. If you want to create a casual area, you can use oversized lanterns made out of bamboo and wicker baskets. The most important thing to remember with these designs is to seal the inside and place a glass votive to hold the candle. If you want a more traditional lantern, you a metal frame with glass panes. These can be hung around your space, used as table lights, or attached to the exterior wall of your home. 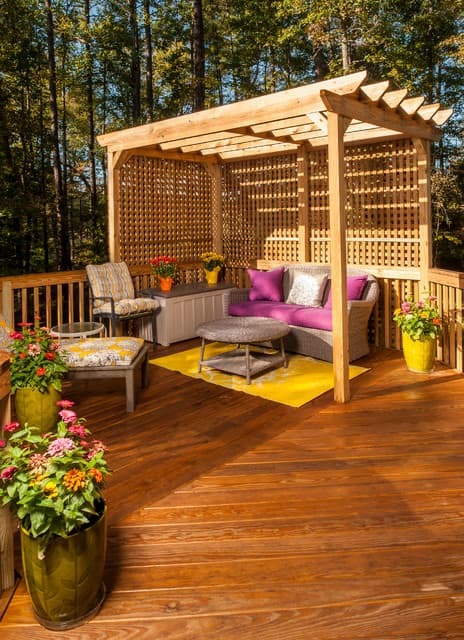 Once you’re deck is built, shaded, and lit, it’s time to add furniture to complete your raised deck design! There are a million different raised deck ideas as to how to use your space. Your deck is an extension of your home and should reflect your personality as a homeowner. If you’re looking for some inspiration, these are a few popular raised deck designs. If you plan on doing a lot of outdoor entertaining , you can create an outdoor kitchen and dining area on your deck. Your outdoor kitchen can be as simple as a backyard grill or it can be a full kitchen, including a fridge, counter space, and stove top. This keeps your event completely outside and you can stay outside with your guests the whole time. If you want to keep any excess smoke away from your dining area, consider zoning your spaces. Use your under deck patio as a dining area. A deck stair allows you to move from floor to floor with ease and efficiency. Seating areas are one of the most popular designs for a residential deck. It gives you the flexibility to relax on your deck alone and enjoy the outdoors, or gives you plenty of space for outdoor entertaining. 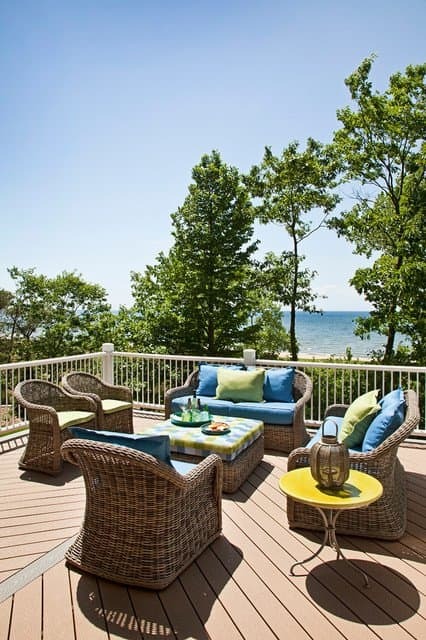 There are plenty of outdoor furniture options that feature comfortable cushions and frames to match your deck design. Built in seating is a great option for a completely unique deck design. If you want an interesting and unique feature to your deck, a conversation pit is the design for you. You can sink the seating into the deck floor itself for a cozy place to catch up with friends. Raised decks are a great addition to a home that plans on outdoor entertaining often. It has a large range of design options, including the materials and function of the space. It also opens up your backyard for multiple uses. 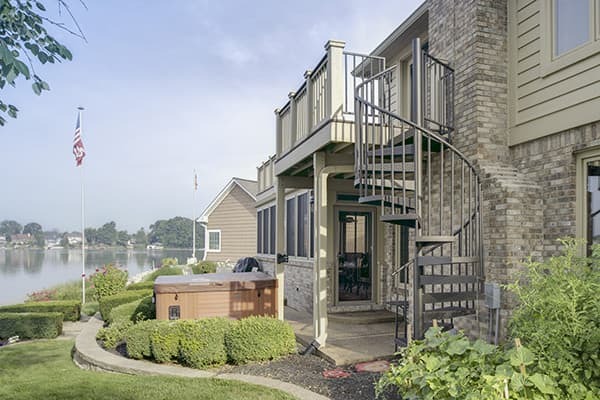 If you want to be able to access your backyard from your raised deck and a spiral stair seems to be the right fit, give one of our consultative designers a call!